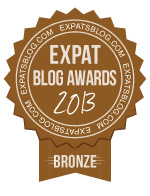 ExpatsBlog.com Expat Blog Awards 2013: Germany Bronze Award! Thank you for offering great ideas and fun stories, too! I love Thrifty Travel Mama!